CTS ($46,295) comes standard with the 2.0-liter turbocharged engine, leatherette (vinyl) upholstery, CUE infotainment with an 8-inch touchscreen, Bluetooth, 11-speaker Bose audio, 10-way power front seats, a rearview camera, rear parking assist, and 17-inch wheels. CTS Luxury ($51,995) adds leather upholstery, HID headlights, a power tilt/telescoping steering column, and panoramic sunroof. 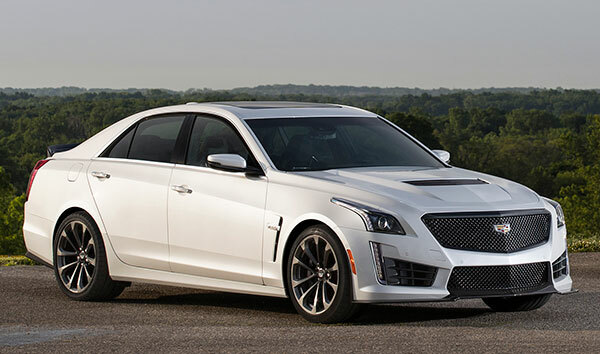 CTS Premium Luxury with V6 engine ($59,495) upgrades with a rearview camera, surround-view cameras, head-up display, 18-inch wheels, parking assist, tri-zone climate control, heated rear seats, and a 12.3-inch gauge cluster. CTS V-Sport ($60,995) comes with a 420-horsepower turbocharged V6 engine and rear-wheel drive, along with Magnetic Ride Control, Brembo brakes, a limited-slip differential, and 18-inch wheels. Premium ($71,095) upgrades further with 20-way power front seats, reconfigurable gauge cluster, aluminum pedals, adaptive cruise control, and front/rear automatic braking. CTS-V ($86,000) features a Corvette engine and Nurburgring handling. The CTS, maybe best if not longest, embodies Cadillac’s iconic design theme called Art and Science. It might just as well be called Angle and Edge, it does those things so well. It isn’t unanimously loved, but who is? Last year the midsize luxury sedan got a new grille and headlamps that fit into the fenders in a way that visually lowers the nose. At the rear, tall taillamps are stacked on vertical exhaust tips. There is a Carbon Black appearance package. Speaking of carbon, the hood and bumpers on the CTS-V are carbon fiber. The fenders are fat, to fit the fat tires. The CTS cabin is handsome. On the Luxury Premium model, the stitched leather upholstery and real wood trim feel right together. Incongruously, a giant 12.3-inch screen replaces real gauges, making the dashboard look futuristic on this model. The front seats are exceptionally comfortable; wide, deep and not too soft. Ready for journeys, long hours in the saddle. If you think you’ll need to adjust them 20 ways, and not just 10, that option is available. The sloping roofline and thick pillars make passengers duck their heads, when climbing into the rear. But there’s comfortable space back and good headroom back there, even with high rear cushions. The trunk holds 13.7 cubic feet, less than bountiful for a midsize sedan. Active noise cancellation helps keep the sounds of the engine out of the cabin. Confidence, poise, and good as the Germans, that’s how the CTS rolls. The base 2.0 turbo has haste about it. It is possible to make the engine strain, but that’s beating the tar out of it. It’s strong enough that the V6 doesn’t look so great, for the extra cost. The V6 brings 335 horsepower v 268 hp in the turbo four, but 268 is plenty to get you down the freeway with the front-runners. The V6 might be the choice for long-distance driving, with its longer legs. Its handling and response are progressive and predictable, and it only gets one less mile per gallon. If that’s not enough, the V-Sport model offers the 420-horsepower twin-turbo V6. Now you know you have an engine under the hood, not an invisible effective powerplant. The v-sport also gets including quicker steering, bigger front brakes, 18-inch wheels with wide Pirelli tires, and of course a track mode. Cadillac’s eight-speed automatic transmission deserves high praise in any model. In the CTS-V there’s a beefed-up version to handle the massive horsepower. It’s quicker and even smoother than in the other models. The available Magnetic Ride Control suspension uses dampers filled with magnetically charged fluid; in a matter of milliseconds, the system can stiffen or soften the dampers. GM’s magnetic dampers, used in other models, are correctly hailed for being consistent and effective, forgiving but never soft or floaty. Last but for sure not least, the CTS-V is the ultimate American hot rod, true blue to its roots, all of them. You can not buy a car like this anywhere else. A beautiful forward-looking Cadillac sedan that handles like it was developed on the Nurburgring which it was, using a Corvette Z06 engine, a 6.2-liter supercharged pushrod V8 pumping out 640 horsepower and 630 pound feet of torque, pushing it from zero to sixty in 3.7 seconds and to a top speed of God only knows. The CTS is strongest and most special at the bottom and top of its lineup. Great looks, great cabin comfort, perfect eight-speed automatic no matter what, but it’s about the engines. Base 2.0-liter turbo four gives up little to the non-turbo V6. If you must have more, skip to the twin-turbo V6. Top of the line, the strongest and most special: the CTS-V. It’s one of a kind, and a bargain given its performance capabilities.